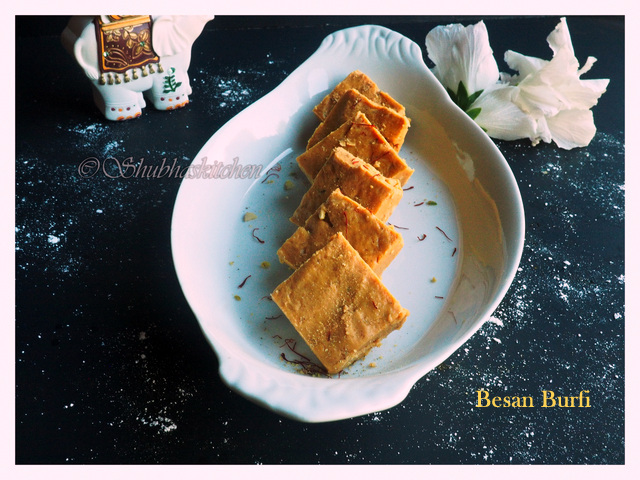 Besan burfi is a delicious burfi popularly prepared in India. 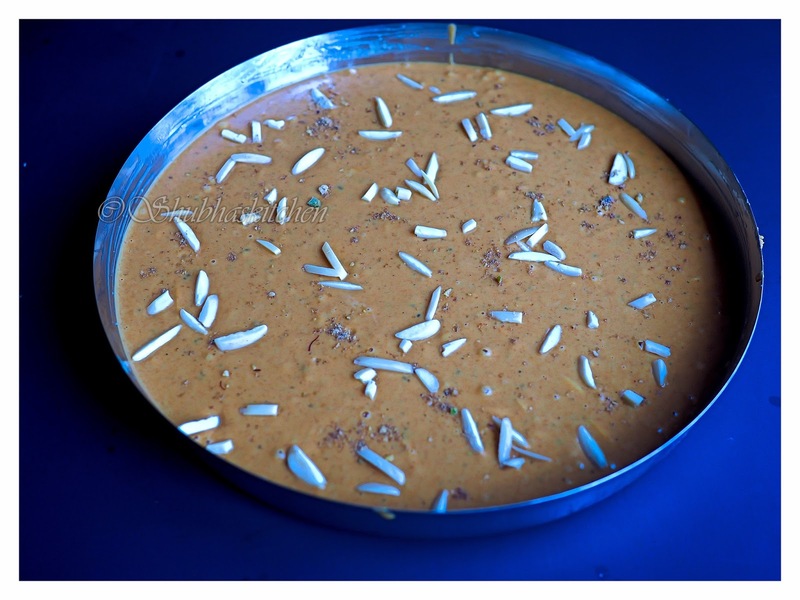 Its a perfect sweet for any festive ocassion. Ganesh Chathurthi is just around the corner. 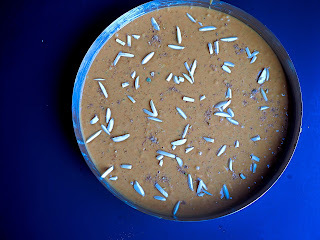 Try making this sweet for the pious occasion :) Gram flour / besan is first roasted on low heat along with ghee / clarified butter until it changes color to red-brown shade.Add the almond bits and cardamom powder and turn off the heat. Set aside to cool. Later mix powdered sugar and let the mixture set in a greased tray. Once set, cut into squares. Melt ghee in a deep and thick bottomed pan. 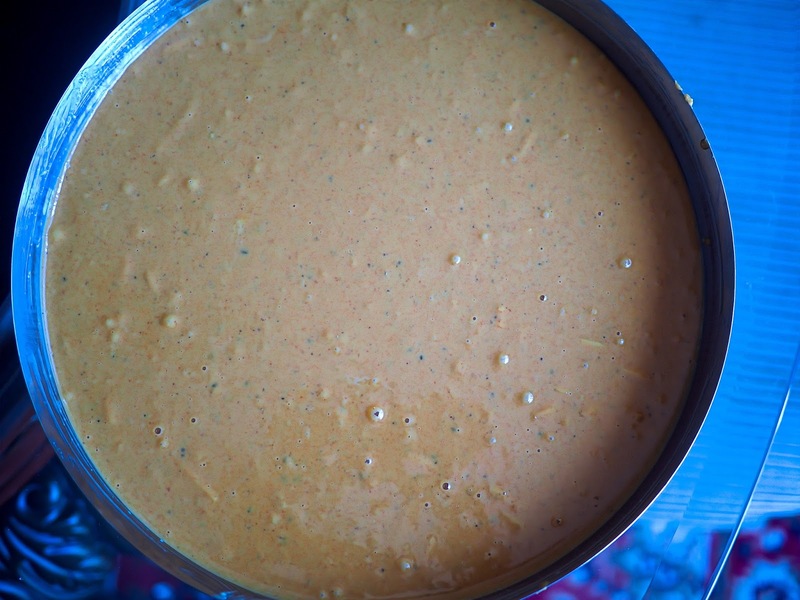 Once melted, add the sieved chick pea flour. Mix well. Cook in a low-medium heat stirring regularly. Cook until the color of the chickpea flour turns to a nice red-brown shade and you get a nice aroma (Note: Its important to cook on low-medium heat. It does take some time to roast the flour but the effort is well worth it:)). Sieve the powdered sugar to remove lumps and add to the now cooled chickpea flour. Mix well. Pour it to a greased tray or plate. Add the remaining almonds on top. Sprinkle some Everest milk masala (optional).Let it set for 3-4 hours. 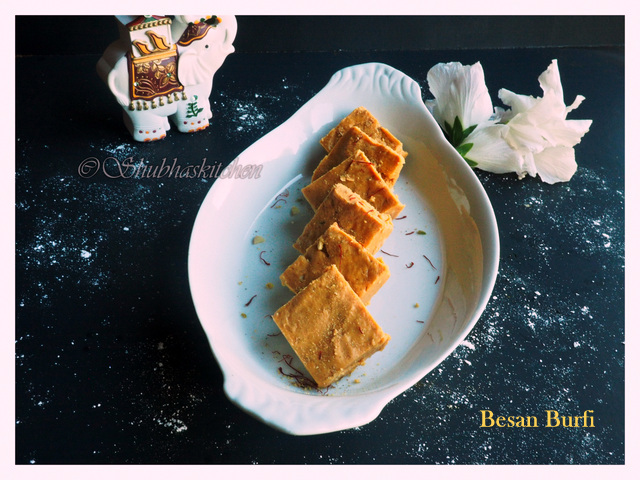 Any sweet with besan is my family favorite. You got it perfect. Have a great day, Shubha! Wow! They look so perfect! 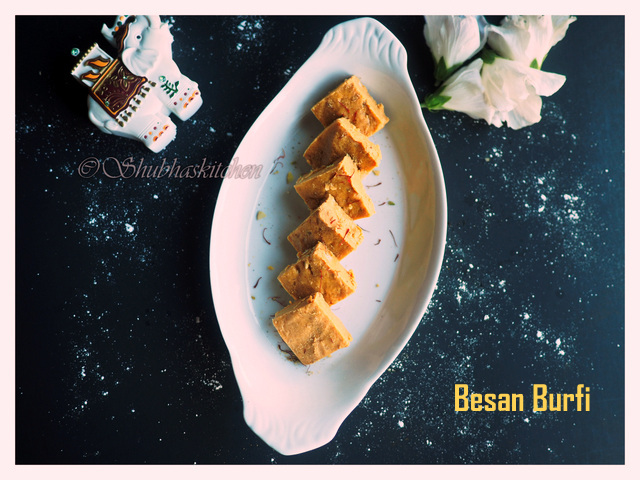 I love besan laddoos so much and sure will love these burfis more.. 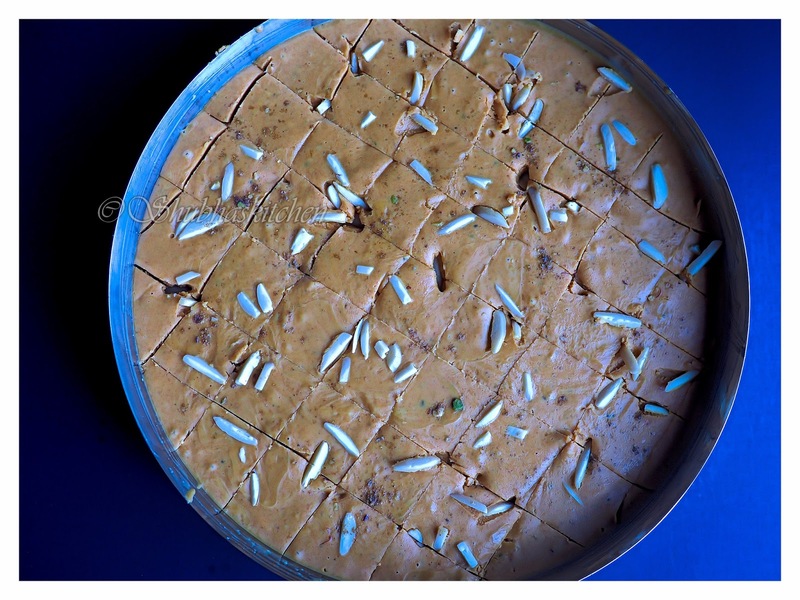 I'm yet to prepare sweets for chaturthi, will try and make these burfis..
Ohlalala! This recipe is treasured for perhaps to be tried during Deepavali. 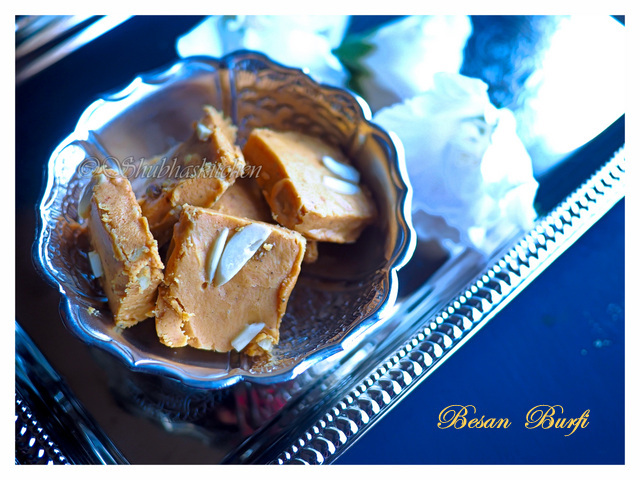 Lovely, few ingredients and I think I will pulled through making these lovely fudge. Burfi looks super delicious dear....It has come out so perfect!! 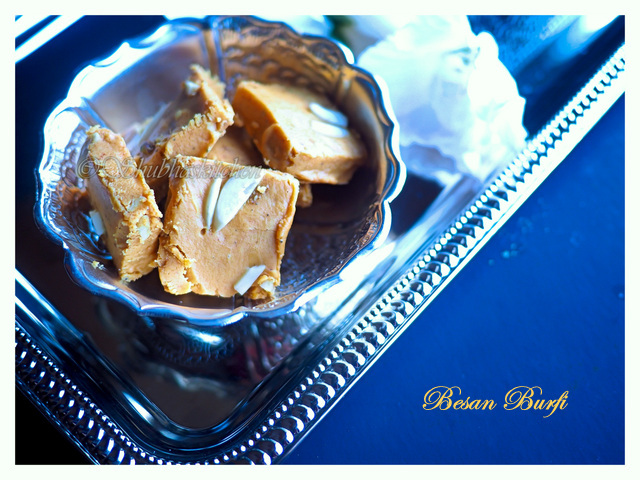 Burfi is looking just outstanding with that lovely straight plated presentation... excellent dear.